Read the Publisher's Weekly book review of finance books, including GETTING YOUR FINANCIAL HOUSE IN ORDER. It's a long article, so scroll down to "Mammon-Friendly Tomes," at the bottom of the article. Or read a brief excerpt here.
. . . Finances can frequently have a spiritual component—consider the Bible, which is laced with exhortations to help the poor and warnings against the evils of loving money. And inspirational publishers are turning out personal finance titles that use scripture to back up their strategies, preaching that you can't serve God until you get a grip on mammon. Broadman & Holman's frontlist contains several money-management titles, including No Debt, No Sweat! (Jan.), in which Steve Diggs teaches that spiritual poverty leads to overspending, resulting in debt that robs Christians of peace and freedom. In the author's words, "Whether it's paying off a car loan that's more than the value of the car itself, figuring a way to finance college without robbing the retirement fund, or learning to walk more serenely with God—it all has to do with what enslaves us." 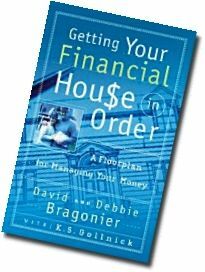 Out last month from B&H Getting Your Financial House in Order: A Floorplan for Managing Your Money by David and Debbie Bragonier, which the publisher calls "a biblical perspective on planning that includes scriptural principles." The book's chapters link a house's rooms with financial concerns. The kitchen, for example, holds "a recipe for financial freedom (planning and budgeting)." Drop me a line! Click here.